More cool things about Firefox; Spellcheck! I recently discovered a little-known feature of the Firefox Browser, Spellcheck or Spell Check. You may already have come across this feature in your word processing software, where it checks spellings as you type and underlines words that it thinks you've spelt incorrectly. However, although the spellcheck function is active by default when you install the latest version of Firefox, it doesn't always work. So, if you're typing a post in Facebook, say, it won't underline the spelling mistakes and you're likely to post something like, "I was teling my freind the other day..." and Firefox spellcheck won't catch those errors. First, check if spellcheck is on. To do that, in Firefox, go to Tools--> Options. Click the, "Advanced" tab and make sure "Check my spelling as I type" (outlined in red in the image) is selected. If it isn't, select it, restart Firefox and make a blog post or post to Facebook and check if you're getting those red, squiggly underlines that indicate spelling mistakes. 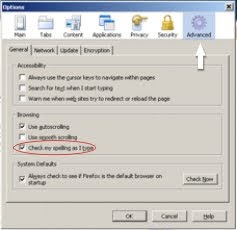 If, "Check my spelling as I type" is selected, and spellcheck still isn't working, you need to install a dictionary from the Firefox Add-ons page. Go to the Dictionary Add-ons page at Mozilla. Select the dictionary you want to add. I selected English (UK) because that's the language with which I'm most comfortable. You can browse through the 14 pages of dictionary add-on links and select the one you want. Click the, "Add to Firefox" button corresponding to the dictionary you want. Firefox will ask if you're sure you want to install that add-on. Click "Install Now" in the dialogue box. Wait till it installs. Firefox will say that it needs to re-start for the add-on to work. Either re-start Firefox immediately or later. Either way, after you re-start Firefox, spellcheck will work. However, spellcheck works only for text input (blog posts, posts on Facebook, etc.) It doesn't work for form input. If I type "depakmorris" instead of "deepakmorris" when I log into Gmail, for example, it doesn't indicate that I've made a mistake. I'll tackle this in another post, once I've conducted sufficient research. There's a phishing scam doing the rounds, especially on Yahoo!, that sends you a very official-looking email that says your account needs to be verified and will be deleted unless you verify it. It asks you to reply with your username, password, physical address, etc. Rule number one and only: NO mail provider asks for your password. Not if it is a legitimate service provider. Yahoo!, Rediffmail, Gmail or other mail providers will never ask for your password. password, security key, or other sensitive information is part of a scam to gain unauthorized access to your account." So never give out your password, no matter how official the mail demanding it looks, even if it appears to come from your mail service provider. Check with your provider using the Help button and searching for "phishing", which is what this kind of scam is called. 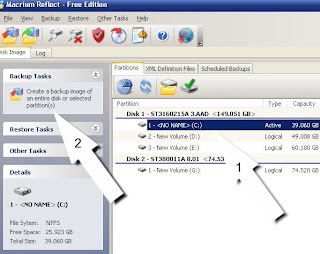 While Part I of this 3-part tutorial told you how to create a "mirror" image of your System Disk or Sytem Drive and Part II told you how to create the Rescue Disk that you need to restore your system, this part tells you how to use the Rescue Disk to restore your system. You may want to print this sub-tutorial and store it safely because you won't have access to files on your hard disk or the Internet while restoring your system. First of all, you need to make sure that your CD-ROM Drive is the Primary Boot Disk. This involves tinkering with the CMOS settings of your computer and can be a bit tricky. You can check this article from computercompanion.com for an explanation of the CMOS and BIOS. Now, the problem is that there is no standard way to enter the CMOS and change the settings. Different computers have different ways to do this so I'm going to give a general description of how it's done. To do this, restart your computer and READ all those messages that flash on the screen. The bottom of the screen tells you what key to hit to enter Setup. This may be called "CMOS Setup", "BIOS Setup" or just "Setup". If you have good reflexes, you can hit that key at that point and carry on from there. I'm presuming you've printed this sub-tutorial and can therefore read what to do next when you're in CMOS Setup. In most cases, especially newer computers with better processing capabilities, you won't be able to hit the key fast enough, though. If so, don't panic. Restart the computer over and over again until you're sure which key will take you to BIOS Setup (or CMOS Setup, or Setup). Then restart your computer one more time and repeatedly hit that key once your screen goes black. Don't keep it pressed, hit it repeatedly. You should be presented with a screen that's primarily blue or blue and grey, with text in white. Congratulations! You're in CMOS / BIOS Setup! Look for a tab or option that says, "Boot". Use the ARROW keys (or + / - keys on some computers) on your keyboard to go to that tab / option and hit Enter. The mouse doesn't work in CMOS Setup. When you're in the Boot tab / screen, look for an option that says, "Boot Sequence" or "Boot Order" or anything that indicates the order in which the computer will examine drives in order to start. If that option isn't the one highlighted, use the arrow keys to go up, down, left or right to highlight it and hit Enter. You'll be shown the Boot Order or Boot Sequence, which is the sequence in which the computer looks for bootable drives. Make sure your CD-ROM Drive is the first. The screen should have instructions on changing the boot order, usually on the bottom right of the screen. Once you've set the CD-ROM Drive as the Primary Boot Disk or Device, save the settings and exit. The screen should have instructions on how to do this. It's usually the F10 key. Now for actually using the Rescue Disk! This is actually the easiest part of the whole exercise. 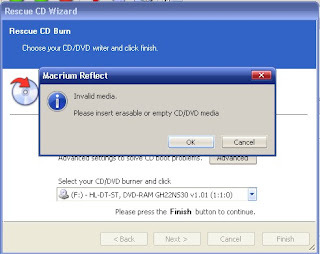 Just insert your Rescue CD, restart the computer (you may need to use the physical restart button if your system has crashed completely) and follow instructions as they appear. You'll be asked to select the New Partition Type. Make sure "Active" is selected and click "Next"
You'll be asked if you want to verify the image file you created. Select "Yes"
You'll be presented with another dialog box that offers you two choices, "Back" and "Cancel". Click, "Cancel". I know that this last step is confusing but click, "Cancel". Your computer will restart and your familiar desktop will soon stare you in the face. That's it. You've successfully cut days of work to a couple of hours. You don't have to reinstall your software or Anti-virus or anything. Your system (computer) is back to where it was when you backed it up. 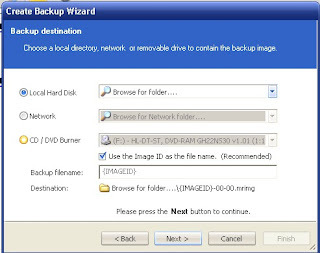 Part I of this three-part tutorial covered the hardest part, creating the mirror image or backup of your System Disk for Winows XP. The next part is to create your Rescue Disk. If your computer crashes for any software-related reason and you can't restart it normally, you'll need some way to access the mirror file you made in Part I of the process. You can do this by using a Rescue Disk, which obviously have to make BEFORE your system crashes (unless you have access to another computer that works and can create the disk there). Creating a Linux-based Rescue Disk is a very simple operation and works in most cases. If it doesn't, ask me directly and I'll make a tutorial on creating a Rescue Disk with Bart PE, another option in creating a Rescue Disk. 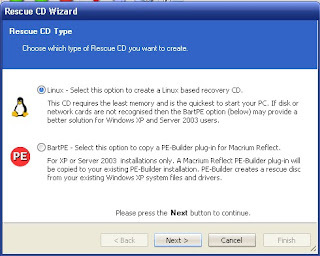 This post tells you only how to create a Linux-based Rescue Disk. Select the "Linux" radio button and click, "Next"
Insert a blank CD, click "OK" and then, "Next". Then just sit back while Macrium Reflect creates your Linux-based Rescue CD. It hardly takes a minute or so. If this process doesn't work for you, write a comment that it doesn't or ask me directly and I'll write a tutorial on creating a Win-XP based Rescue Disk. If you're anything like me, you frequently format your System Drive (the drive that "boots" or starts up your computer - usually C: or C Drive). Even if you don't do it frequently, Windows being what it is, you might have to format the System Drive and reload Windows at some point. And then you have to reinstall all your programs. MS Office, Yahoo Messenger, the works. That's it! You're back to where you were before your system went haywire! Part 1 of this tutorial deals with the first step, backing up your system files so that you can restore it later. Part 2 will deal with creating the Rescue Disk and Part 3 will deal with actually reinstalling your system disk so that you lose no time in getting back to work. Firstly, you have to understand that your computer starts up because of your system disk. With Windows, this is usually your C Drive, where Windows is installed by default. So, if you've bought a desktop or laptop with Windows pre-installed, Drive C is your system disk. If you bought an assembled PC and asked the hardware guy to install Windows XP on another drive, that's your System Disk. Ask your hardware guy which your system disk is if you aren't sure. The rest of this tutorial presumes that you bought a standard desktop or laptop with Windows XP pre-installed. That makes your C Drive the system disk. First, you need to download and install the Macrium software. The free version is available here. Download it to your computer, double-click the downloaded file and follow instructions in the installer. The Macrium backup software will be installed on your computer. Once installed, the installer should give you an option to start Macrium backup upon exiting the installer. If it doesn't, or you didn't keep the "Launch Macrium" checkbox checked, just go to Start-->All Programs-->Macrium-->Reflect-->Reflect and you're good to go. This is where you actually create the backup. Keep track of where you save the backup file, it's important. 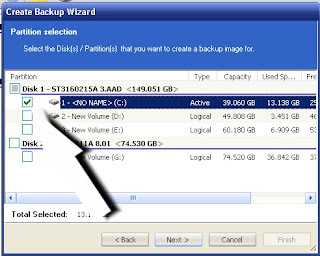 In Macrium, Select your System Drive and click the "Create a backup image..." message on the left. You'll be taken to the "Create Image" Wizard. Blindly click "Next". The wizard will then ask you which drive to back up. This has to be your system drive. It's usually C Drive in Windows (all versions) but if you're unsure, ask your hardware guy. After that, it'll ask where yo u want to save the image file. Any drive other than the system drive is fine. That means any drive other than C if you bought a standard PC / laptop with Windows pre-installed, or ask your hardware guy if you're unsure. This tutorial presumes that you have drives other than C installed. You'll need about 15 gb of space, so choose a drive that has that much of free space at the minimum. You can also save the image file to a CD / DVD. If you want to do that, select the CD / DVD Burner radio button, click next, and follow instructions. Depending on the option you've selected and the amount of data on your system drive, it'll take from a few minutes to an hour or more to create the copy of your System Disk. It's worth the wait. 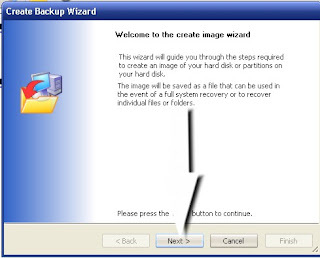 Once the wizard tells you that the image has been created, Part 1 of your backup / restore process is done. The next step is to create your Rescue Disk so that you can start up your computer in case things go wrong and Step 3 is to restore it to its state before things suddenly went haywire. I'll be covering those steps in the next two tutorials. Meanwhile, back up your system drive NOW! Do you have static images of snow or other things that sparkle in real life? Do you wish you could make them sparkle? Now you can do just that with two bits of software used in tandem, one a commercial suite available on a 30-day, full-featured trial and the second completely free. First, get your material ready. Shoot, download or identify a pic to which you want to add sparkles. Please respect copyright and do not download copyrighted images! Next, download and install ParticleIllusion from Wondertouch. 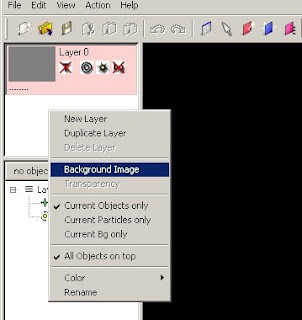 Right-click in the white area where it says "Layer 0" and select "Background Image". 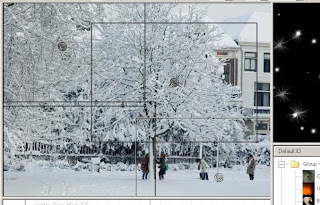 Then navigate to where your picture / photograph is and select it, then OK your way out. If you are told that the image doesn't match the stage size and if the stage should be resized, click "OK". The image will be seen on the "stage", the central part of your screen. 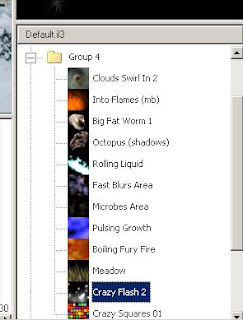 Now click the + sign you see against Group 4 on the right of your screen and select "Crazy Flash 2". Make sure "Crazy Flash 2" is highlighted in blue. For some mysterious reason, this is important. If it isn't highlighted in blue, randomly select any other effect and then click "Crazy Flash 2" again. Then hit the "Play" button to its immediate right. Use the Space Bar to stop the preview. If you don't like the effect, hit Ctrl+Z to undo the sparkle addition and click in the picture again if you want to add the sparkles to a different location. Once you are satisfied with the animation, it's time to save the output. 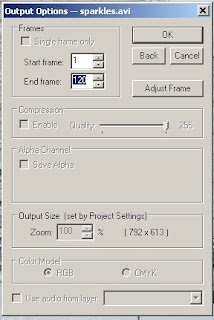 Set Stage Size to 640 x 480. Set Frame rate to 25. Leave everything else unchanged and OK your way out. Don't forget to give your output file a name. 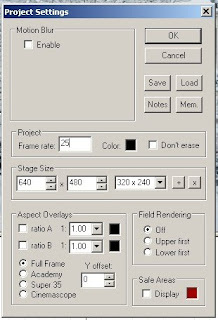 When asked for the number of frames to save, change the "End Frame" to 10. 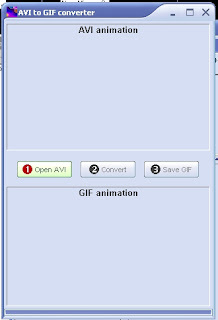 Otherwise the output will be too heavy to convert to GIF. 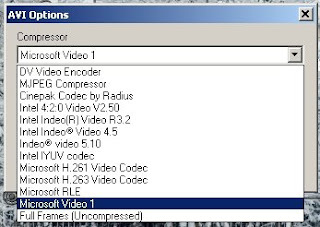 When you are presented with a dialog box that asks which Codec to use, click the little arrow on the right of the default Codec and select "Microsoft Video 1". THIS IS IMPORTANT! OK your way out and your output will be saved as an AVI file. 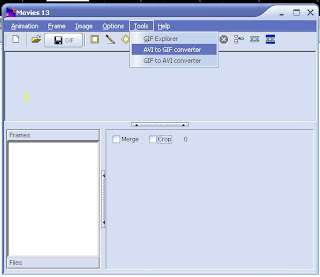 Now it's time for the second part of the exercise, converting your AVI file to GIF so you can post it to your blog / website. Close ParticleIllusion. Save the project if you want to work on it later. 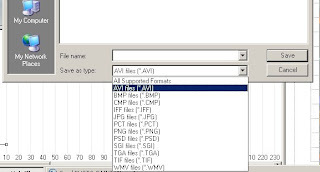 Download and install Movie13 from JanSoft. After it installs it opens a dialog box that shows a check mark against "Start Movie13". Leave it checked and OK your way out. Movie 13 will start. That's it! You can now upload the GIF to your favourite online repository and post it to your blog or website!